POPE FRANCIS HAS accepted the resignation of Bishop of Dromore John McAreavey and the former Bishop of Raphoe, Philip Boyce, has been appointed administrator. McAreavey announced his resignation on 1 March in wake of concerns raised by parents of children whose Confirmation he was due to preside over later this year. It was reported earlier this year by the BBC Spotlight programme that McAreavey had officiated at the funeral mass of a priest accused by 12 people of sexual abuse. Fr Malachy Finnegan, who died in 2002, was a teacher at St Colman’s College in Newry from 1967 to 1976. The abuse claims against him were detailed in the BBC Spotlight programme in February. He said that he had made an “error in celebrating Finnegan’s funeral. 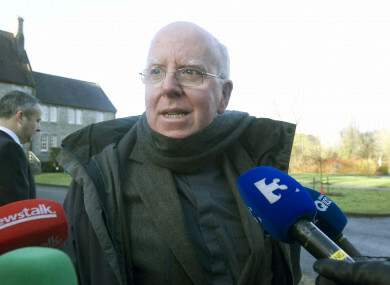 A spotlight reporter revealed in late February that Bishop McAreavey had celebrated a mass alongside Finnegan in 2002. John McAreavey was ordained a priest in 1973 and was ordained Bishop of Dromore in 1999. In a statement this afternoon, Archbishop Eamon Martin said he wished to acknowledge McAreavey’s 19 years of service as a bishop. “As president of the Irish Catholic Bishops’ Conference, I thank him for his generous contribution in a wide variety of roles as a member of the Bishops’ Conference during that time. As the bishops stated following their Spring 2018 general meeting earlier this month, the Church can never become complacent concerning the safeguarding of children. The Church is committed to both the review process of dioceses undertaken by the National Board for Safeguarding Children in the Catholic Church and to cooperation with any inquiry required by statutory bodies. Bishop Boyce, aged 78, was raised in Co Donegal. He joined the novitiate of the Discalced Carmelites in Loughrea, Co Galway, making his first profession in 1959. Having completely philosophical studies in Dublin, Boyce studied theology at the Teresianum in Rome, where he was ordained on 17 April 1966. Boyce has spent much of his life since teaching and preparing men for the priesthood in Rome. He was ordained the Bishop of Raphoe on 1 October 1995 in the Cathedral of Saints Eunan and Columba in Letterkenny, Donegal. Email “Pope Francis accepts resignation of Bishop of Dromore John McAreavey”. Feedback on “Pope Francis accepts resignation of Bishop of Dromore John McAreavey”.